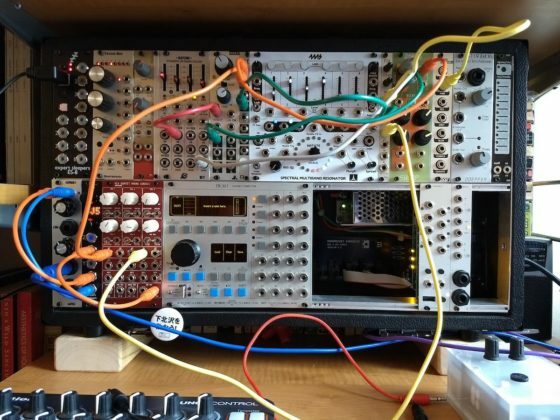 I recently reworked about half my modular synthesizer, with some key priorities in mind, among them (1) introducing some modules with their own strong personalities, notably the 4MS Spectral Multiband Resonator and the Ieaskul F. Mobenthey Swoop, and (2) having a means to be always recording. I added an Expert Sleepers Disting MK4 between the mixer and the output to use as an always-on recorder. This track is a first attempt I made at using the IFM Swoop. Here the Swoop is producing a triangle wave, bounds of which are changing as the track proceeds (among other variables I’m just beginning to wrap my head around). It’s secondarily being sent through a low-pass filter, to take the upper edge off. I have an old Sony MiniDisc recorder I’ve been meaning to sell or trade for the longest time. After watching one of the recent videos by the musician Hainbach, however, some hidden potential was revealed to me. Hainbach has been exploring unique characteristics of the MiniDisc, such as the granular quality of its fast-forward and rewind artifacts, its ability to easily break tracks into segments, and its gap-less playback. The second and third of those three features are the ones I was most immediately interested in pursuing. That third one, the gap-less playback, isn’t present on all MiniDisc devices, though it was an impetus for Gescom’s ingenious 1998 album Minidisc — Gescom consisting of Autechre working in collaboration with Russell Haswell. Fortunately, my MiniDisc recorder, a Sony MZ-R50, has gap-less playback. This simple little evening project turned out to be a learning experience in more ways than one. 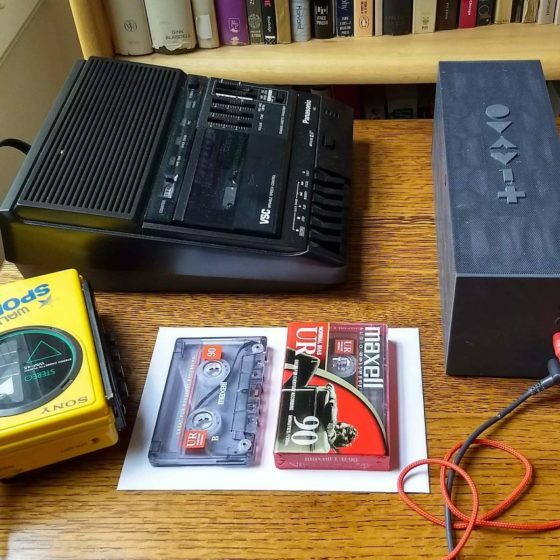 I wanted to record from my acoustic guitar into the MiniDisc, which seemed easy enough, but as it turned out I couldn’t find the microphone that originally accompanied the device. I spent some time looking on eBay and discovered that lots of people selling old MiniDisc recorders have also misplaced their microphones. 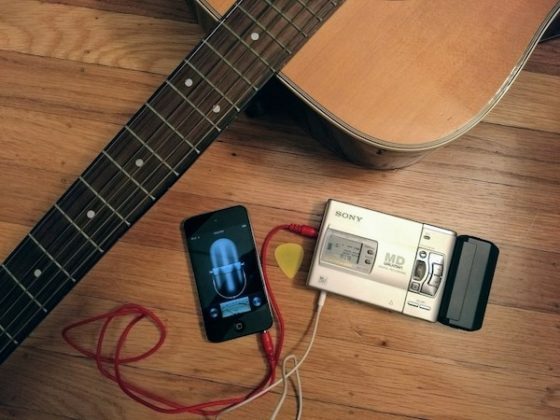 I thought briefly about skipping the acoustic guitar for now and recording from a little iOS synth into my MiniDisc just as a proof of concept, which is when it occurred to me to record my guitar into an ancient iPod and to then record from the iPod into the MiniDisc. This worked fine. The audio was me plucking and strumming a D chord on the guitar for about 30 seconds. I used a standard audio cable to go from the headphone jack of the iPod to the Line In of the MiniDisc. Once the 30 seconds were on the MiniDisc, I used the “T Mark” function on the MiniDisc to subdivide the track into little fragments. This took the one single track and turned it into about 25. After listening to it on shuffle/repeat, I whittled away and deleted a handful of silences, ending with about 19 pieces of varying lengths. In the end, the guitar material played out in little slivers and proved, to my ear, quite pleasing, as soft tones end suddenly and chance permutations render momentary melodies. The question then became: how to transfer the audio from my MiniDisc to my laptop, or back to the iPod for that matter. This isn’t as simple as it sounds. The macOS software Audio Hijack didn’t seem to recognize my headphone input, and neither did my iPod. As it turns out, that’s because the standard headphone jack is different from the sort that laptops and mobile devices recognize these days. The standard audio headphone mini-jack has two little lines on it, if you look closely. The jack of the now-standard (well, until the imminent Bluetooth apocalypse) headphone-with-microphone cable actually has three little lines on it. I need to order a converter for future recordings, but I wanted to finish this tonight. So, I used a cable to connect my MiniDisc player to my Zoom H4n recorder, and then took the SD card from the H4n and put it in my laptop. I used Audacity to lower the treble on it, and then — just to try it out, because the software is new to me — Adobe Audition to trim the close, where the track initially ended too abruptly. The track’s title, “Aida Facing Shimmy 353,” is an anagram of the word “MiniDisc” and the model of my acoustic guitar, a Yamaha FG-335. This is the third Weekly Beats of 2018 — the third week of the biennial series wherein people upload tracks they’ve recorded as part of a communal challenge. It’s a bit like one of those largely non-competitive marathons where the majority of the people are just there to run alongside each other, and the only person anyone is gauging their performance against is themselves. (Which is to say, it’s like the Disquiet Junto to some degree.) 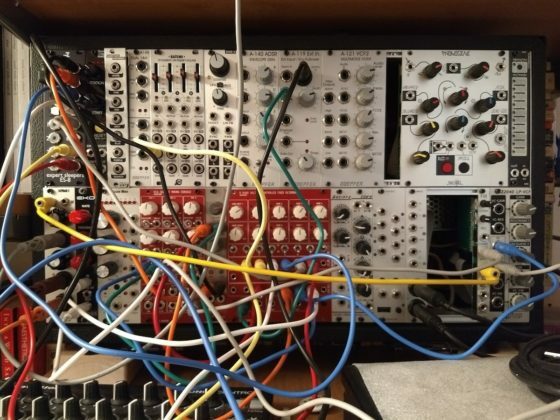 For this week, I continued my efforts to combine electric guitar and modular, to run my guitar through my modular synthesizer in a manner that is, in essence, a very large effects pedal. My main goal this week was to incorporate a third element into the guitar + modular combination. The third element is piece of software called Rack, available for free from vcvrack.com. It’s a virtual modular, for which at this stage well over a hundred different modules have been created, most of the available, like the software itself, for free download. 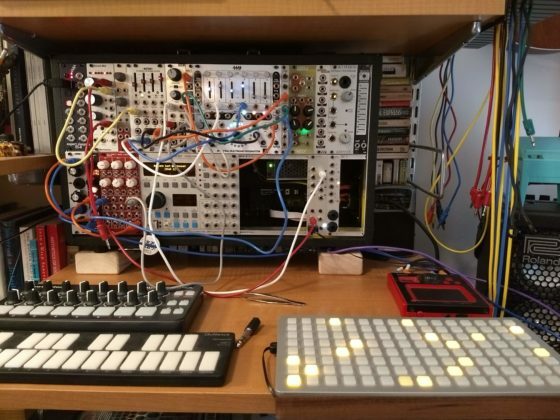 I have a physical module in my rig that lets me send and receive both audio and CV (control voltage) signals, and so I hooked that up to Rack and used Rack-based modules to augment the sounds being processed by my physical modular synth. Last week I ran the full guitar line through a looper, whereas this week I experimented with just sending two bands of the audio spectrum. It’s still very much a test case, but I thought it more important to get something up this week, to maintain the Weekly Beats cadence, than to skip a week out of self-editing. There’s some overdub toward the end, where I layered in material from an alternate take. That latter material involves no live playing. It’s all the circuit afterglow of the recording, where the guitar fragments caught in the system cycle through, morphing a tiny bit as they go. I didn’t upload this piece to SoundCloud, but you can give it a listen on the Weekly Beats website at weeklybeats.com/disquiet.